"Here is a very different and simple way of enjoying avocados. Use low-sodium soy sauce if desired, but full-flavored is best." Stir together garlic, ginger, and soy sauce; set aside for five minutes to allow the flavors to blend. 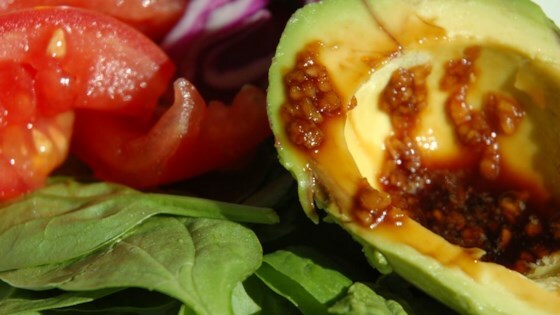 Cut the avocado in half, and discard the pit; divide the sauce between the avocado halves. Eat with a spoon! A fast, simple way to enjoy an avocado with little preparation and only a few ingredients. It is a definite keeper. I used the low sodium soy sauce and loved it. Thanks Josie! Very good as is, even better with a 1/2 teaspoon of sesame oil. Thanks for the recipe! I Liked this best when mashed together like guacamole; served on a bed of spinach and tomatoes, it was delicious! Low sodium soy sauce worked perfectly in this unusual dish. This is excellent. I probably doubled the amount of ginger. If you let the ginger & soy sauce sit together a bit, the flavors really pop. This is delicious as is, but I always add sesame oil - it really makes the flavor pop!